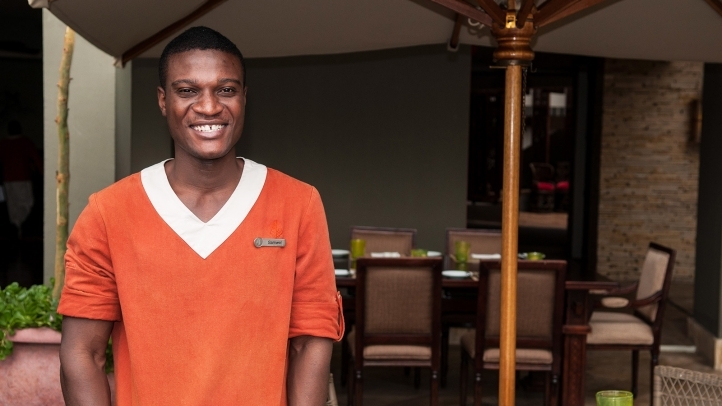 Serengeti, Tanzania, 2015-7-7 — /Travel PR News/ — Building on the recent, successful partnership with Serengeti Tourism College (SETCO), Four Seasons Safari Lodge Serengeti has recruited Samwel Paul as the first student to receive full time employment at the property. First establishing the partnership with SETCO in October 2014, Four Seasons Safari Lodge Serengeti has since set in place a structured program to support students through the opportunity to experience a three week internship at the property; the delivery of educational presentations at the college by managers from the Lodge; hosted property visits and interviewing practice with the Lodge’s management team; plus support for the maintenance and construction at the college itself. Samwel was one of the very first students to complete a three week internship at the Lodge in October 2014 and now holds the position of a server in the Lodge’s restaurants. A native of Samura, Samwel is one of 500 graduates from SETCO, which is a non-government institution based in the township of Mgumu. With a choice of subjects ranging from front office operations to tour guiding and driving, housekeeping and food and beverage, students are able to complete a one or two year course (depending on area of study) following which SETCO assists them to find permanent employment in tour companies, lodges, hotels and camps across the country. “Our partnership with SETCO is a fantastic opportunity for us to support the future of Tanzanian hospitality. We have played an active role in guiding students through the internship process and it is exciting that we have now gained a full time employee from our SETCO partnership,” comments Lodge Manager Martin Cody. The students working on placement at the Lodge covered a variety of positions, including Housekeeping, Laundry, Kitchen, Stewarding, plus the opportunity to join the Maasai warriors in Security. This entry was posted in Hospitality, Hotels, Luxury, Tourism, Travel Human Resources, Travel Management, Travel Services and tagged Four Seasons Safari Lodge Serengeti, Martin Cody, Samwel Paul, Serengeti Tourism College, SETCO. Bookmark the permalink.